The O2M camera from IFM (http://www.ifm.com/ifmgb/web/pinfo080_045_040.htm) was initially designed to be used on mobile vehicles, to monitor the working area or to show machine information. 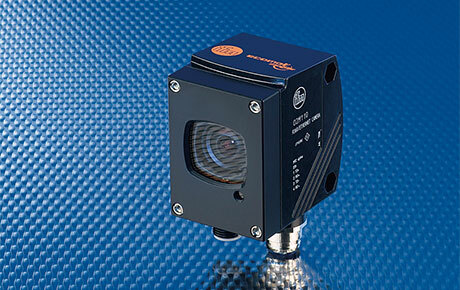 We believe this camera can also be used for machine vision applications which require a view inside confined areas, or where ambient conditions are harsh. Using integrated Ethernet interfaces, the O2M camera system can be directly connected to the PDM360 dialogue monitors, with graphic capability and colour display, eliminating the need for a separate monitor. The digital capture and transmission of the image data enables scaling and free positioning of the camera image. Using a split screen, up to four camera images can be simultaneously displayed via the PDM360 dialogue monitor. In addition, the PDM360 can be used to store individual images on a compact flash card. The O2M camera is fitted with an Ethernet interface for communication. In contrast to analogue camera systems, the camera image can be shown on any number of displays via a simple Ethernet hub or switch. It is also possible to connect several O2M cameras to one display in this way. To use the O2M camera, on a production line or inside a machine, requires an independent lighting system. The Lightune Modular Lighting System provides the ideal solution â€“ the Lightune Ring. The Lightune Ring gives flexible and adaptable illumination. As a general rule, with this camera, a Ring with white LED lights will provide excellent results.